Sumerian Records did well to sign bands like THE FACELESS and BORN OF OSIRIS. Not only have both been successful for the label, but the pair has been a breath of fresh air in an era of modern death metal and deathcore that too often falls flat. BORN OF OSIRIS' sophomore effort, "A Higher Place" continues down that refreshing road, this time with a more refined songwriting approach and greater use of melody than was the case with "The New Reign", an impressive album in its own right. What made "The New Reign" an intriguing affair was the new kids' (literally) blend of syncopated semi-tech death, inclusive of MESHUGGAH and DECAPITATED flourishes, with keyboard melodies and atmospherics. The combination worked because it didn't seem awkwardly juxtaposed or forced. The same holds true, for the most part, on "A Higher Place", except this time the keyboards are woven into the compositions more seamlessly, and when they're used as points of contrast the impact is greater (e.g. sections of "Live like I'm Real" and "Starved"). The act's melodic refinement can be rather surprising for its effectiveness; just listen to "Elimination" and "The Accountable". The aforementioned "Starved" features a strong melody as well, this time with elements that could generally be described as symphonic black metal, while the title track goes from angular and proggy to near pop melodiousness. Those prog metal meanderings come to the fore again on "An Ascent" contrasted against alluring keyboard-created melodies. If nothing else, the songwriting is interesting and keeps one guessing as to where it will go next. Make no mistake, modern death metal continues to be a driving force, although there are metalcore moments, but it is obvious the band sought to push limits and experiment musically. That BORN OF OSIRIS is trying a lot of different things here is, generally speaking, a good thing, but it can also be slightly detrimental, if only because of struggles with cohesiveness. In some ways, I enjoyed the purer, yet still inventive, style on "The New Reign", more than what is heard on "A Higher Place", yet in other ways I can't help but appreciate the leaps and bounds the band has taken in creativity and melodic sensibility here. 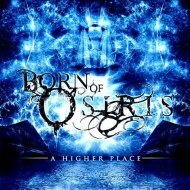 Any way you look at it, BORN OF OSIRIS has released two very good albums in its young career. Somehow I get the feeling that album number three will find BORN OF OSIRIS firing on all cylinders and recording a watershed album.